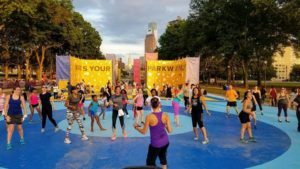 Get your groove on while celebrating Philadelphia Dance Day! No dance experience necessary, just jump in and follow along! Bring the kids – music and choreography will be inclusive for all ages! We’ll be dancing outside, so wear supportive shoes and don’t forget your sunscreen and water. No cost to participate! Then join us again on Dance Day itself, check out the full July 28 schedule on philadelphiadanceday.com.